Earlier this year, Lost Girls intern Patty Hodapp was accepted to the Syracuse study abroad program in Florence, Italy. She has her visa, her passport and her ticket. 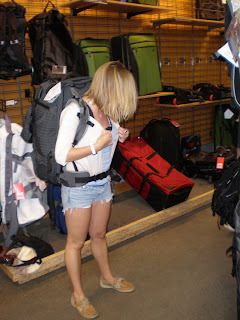 Her next big step was choosing a backpack, and figuring out which essentials were really essential. As the Lost Girls discovered, it’s better for your back to get caught wearing the same outfit a few days in a row rather than bringing half your closet along for the ride. Check out Patty’s tips for choosing a pack that fits, pairing down your belongings, and why she decided to leave her laptop at home. We Americans tend to think bigger is better, but when it comes to buying a travel pack for a European adventure like my own, it took me a while to abandon that philosophy. 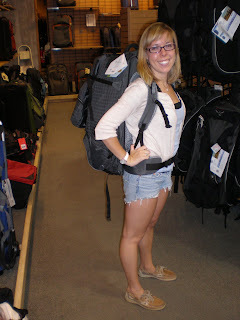 When I got back to Minnesota from college a few weeks ago, my parents offered to take me travel pack shopping at R.E.I., a huge camping/adventure sports store in Minneapolis/St. Paul. The idea of a legit travel pack as my main piece of luggage never crossed my mind. They are expensive and there was absolutely no way I’d fit all my dresses, shorts, pants, blow-dryer, laptop computer, hair straightener, and several pairs of shoes (heels included, ehem) in essentially a huge backpack. I just assumed I’d be hauling my big red suitcase to Florence and then figuring out another backpack to use on my two week travel jaunt at the end of July. Wrong. When we got to the store, a clerk eyed up my torso size and fitted me with a size small women’s pack, which he weighed down with 50 pounds in beanbags. The first time he strapped on the bulky bag, I nearly fell backwards. Once I got used to the feeling of carrying most of the weight on my hips-the packs are designed this way to minimize pressure on the upper back-I tried a few more packs. The ones I looked at ranged from 60 to 80 liters at packed capacity. Each large pack had a smaller day-pack attached to it that would come in handy for short trips. Surprisingly each pack felt very different on my body-it wasn’t like shopping for a normal book-bag-type backpack where you grab one and go. Since the type of pack can make or break a trip, and since they’re a healthy investment of 200-300 dollars, I wanted to be sure I bought the best one for me. Three hours and 230 dollars later I finally bought an Eagle Creek 75 L pack that (fingers crossed) will see me through Italy, the southern coast of France and hopefully Barcelona. 1. Don’t buy a too big of a backpack. Remember you have to carry it and your back will thank you later. 2. Go easy on souvenirs. Shipping to the US is expensive and heavily taxed to try to keep purchases to things you can carry. 4. It’s good to research travel packs online but go to a store and try them on before you buy one. It’s almost like shoe shopping, you need to make sure the bag fits your body just right or you’ll be in for a long trip. I consider myself a seasoned traveler, but most of my trips have involved living overseas for months on end, which always meant bringing clothes for multiple seasons in a big suitcase. Since this trip is only two months, my parents encouraged me to narrow down my stuff to fit in my travel pack. Though I was doubtful, I crammed it till it was pulling at the seams, strapped the pack on and promptly fell over. There was no way I wanted to haul all this stuff through Europe, and if I was going to travel this lightly I’d have to take time to do it right. So I dumped out the bag and started over, making choices between shirts and shoes, pants and shorts. Did I really need seven dresses…? Or brown AND black heels…? Maybe fifteen tank tops was slightly excessive…The fact that I’d be carrying it ALL, quickly helped me eliminate about a third of its contents. I packed again and again, moving weight around, rolling up shirts, Ziploc bagging liquids, eliminating item after item until I finally had it down to four dresses, my running shoes, black heels, sandals, a few tank tops and shorts, travel size toiletries, my swim suit, first-aid kit, a quick dry travel towel, two cardigans and room to spare for a few purchases I’m sure I’ll be making. Excellent. 1. When you first pack, take out about one third of your clothes and put them back in your drawer. No one will remember you wore a shirt two days ago and trust me, I’m as fashion conscious as the next New York girl. 2. Don’t forget to bring nice shoes and heels for the ladies. Unlike the United States, bouncers won’t let you into many clubs or bars if you’re just wearing sneakers or flats. 3. Skip the blow dryer, buy bandanas, cute headbands and pick up a travel size hair gel. 4. Remember you’ll probably buy a few clothing items there so try to budget room in your pack for that. With most of my big bag packed I set about packing the day pack, which I plan to use as carry-on luggage. I made two copies (one for me, one for my parents) of all of my travel documents: passport, visa, health insurance card, driver’s license, plane ticket passenger receipt, flight itinerary etc. Then I added a journal, my monthly agenda, my external hard drive (I opted to leave my computer behind in exchange for internet cafes), my iPod and headphones, a book, my American cell phone, an empty water bottle, and a quart-size Ziploc bag with hand sanitizer, lip gloss, lotion, hair gel and deodorant (all less than 3.0 fluid ounces for airline regulations). I’m getting more and more excited as I write this blog and reflect on the whirlwind of travel preparations I’ve been through in the last few months. This trip has been a long time coming, and tomorrow morning it’ll finally kick into motion when I check my travel pack and fly out of the Minneapolis airport at 7 a.m. to meet the Syracuse group flight to Florence at JFK, New York. I’ll arrive in Florence, Italy early Thursday morning and the adventure begins! 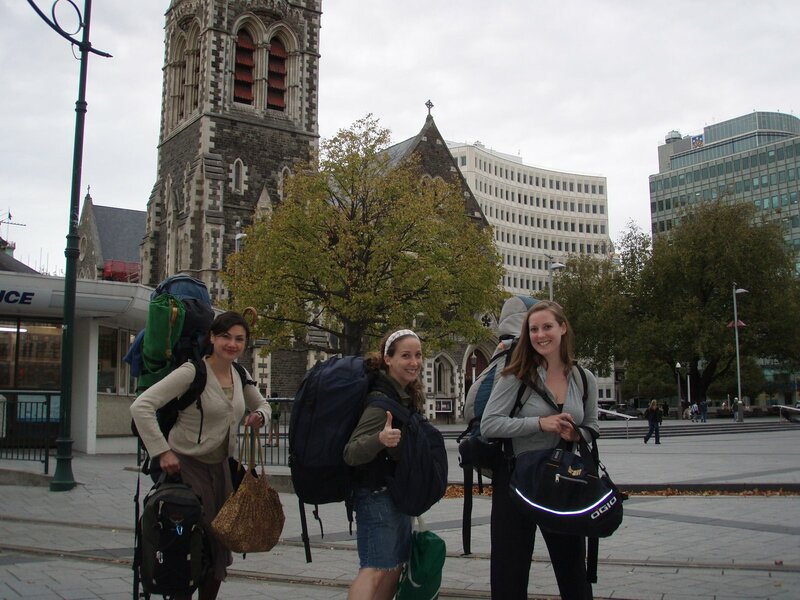 Should You Get an Internship or Study Abroad? Cool Tips! Look forward to reading more updates!! I write for a study abroad/travel website Gulliver and we’d love to have you contribute blogs about your trip if you have time! Thanks! Nice tips! I used a 32L for my one year RTW trip. It looks small, but if you use gallon size ziploc bags (great as compression bags) it fits an insane amount of stuff. For future backpack purchasers, I’d suggest doing some price checking online, because you can get previous seasons bags (usually just different colors) for crazy deals. I paid $70 for my Marmot pack! Here’s my Round the World Packing List. I look forward to reading more about your trip! Cheers! I used a 50L bag and found it to be more than enough on my round the world trip. Next time I'll try 32L. I would never have to check that bag and could save the charge.